The flexibility provided by its single bearing wall offers architects great ease of integration. Médium is the ideal solution for the housing market and for medium-height office and business buildings. A lift without machine room that combines simple installation, high quality and safety of operation. Proposing a simple solution, suitable for the development and replacement market in new and existing buildings. Creating a line of intuitive products that are easy to install and easy to operate. Offering functional interior designs of cars in a range if aesthetic options that meet the needs of the targeted markets. The main themes offered in this line are Univers, Lineha, Série 40, Square, Vendome and Inox. 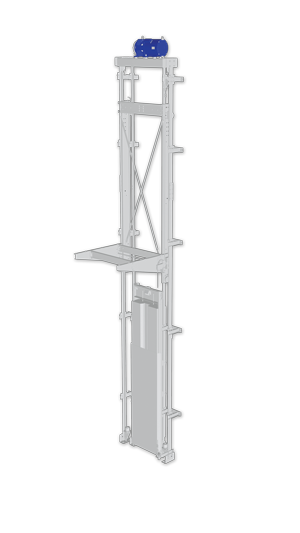 Based on a mechanical configuration similar to that of hydraulic lifts, its installation requires a single bearing wall. This design is characterised by a simplified interface system in combination with a high-performance assembly method, enabling fast commissioning to the benefit of installers and users alike. The medium 3 engine is positioned partially high sheath forming with the strap an open loop by directly connecting the cab and the counterweight. The lift is outfitted with a gearless motor that requires no added oil or grease and no special maintenance, offering optimised efficiency and improved car comfort. Controlled by a variable speed drive, the product line offers energy savings of almost 50% compared to equivalent conventional systems. Most importantly, it is outfitted with an open technology controller, so that its maintenance can be performed by any maintenance company in this line of business. This energy-efficient product line provides many innovative features that further reduce energy consumption. This includes automatic switching of the landing signalling and car lighting systems into standby mode when the lift is idle or stopped, switching certain controller functions into standby mode and manyother features. These functions restart immediately. Compliant with the Lifts Directive 2014/33/EU. 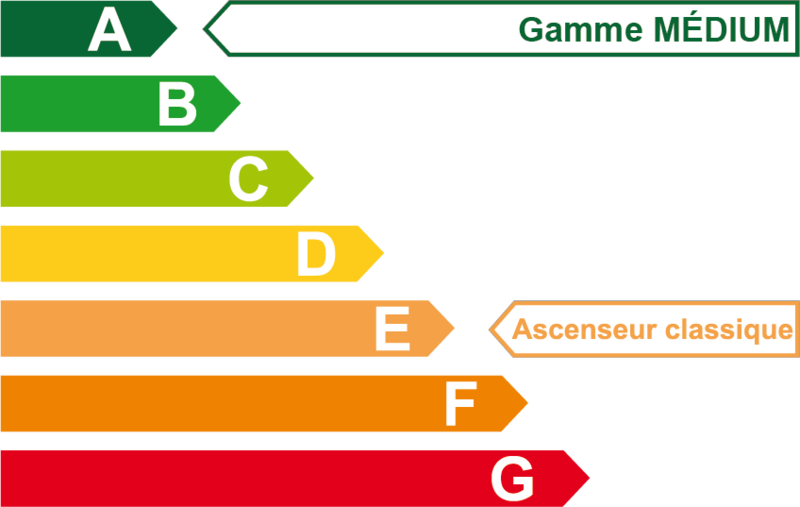 Compliant with the new harmonised standards EN81-20 & EN 81-50. Certified by the APAVE certification body. Offering a fully modular design and a clean style, the landing doors are delivered at the site in disassembled form, outfitted with small posts to which standalone components can be added for easy adaptation to large façades. The SODIMAS products, in particular Medium 2, have achieved the highest rankings in terms of energy savings (according to the German standards on which the VDI 4707 classification was based). These rankings take into account various criteria, such as payload, speed, frequency of use, etc. to assess the energy efficiency of lifts. 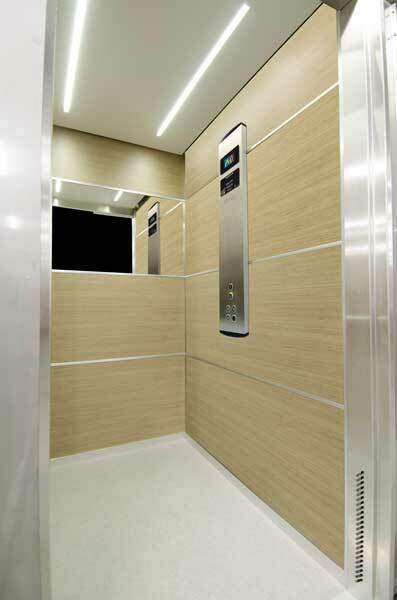 The Medium lift belongs to Class A, which reflects its very low energy consumption. It should be noted [...] that the two lifts with the lowest consumption carry the SODIMAS brand. This […] company, headquartered at Pont d’Isère in the Drome region, is not among the four industry “heavyweights”. Nevertheless, it was able to develop original technologies (replacement of speed-reduction gears by rope and pulley systems), which are also probably more efficient. Source: — ENERTECH cabinet, Report of campaign of measure, URBAN DEVELOPMENT ZONE, ZAC de Bonne, of the project SESAC. SESAC is a CONCERTO project, an initiative of the European Commission for the renewable solutions of energy.